Click here to view our Accreditation Certificate from AdvancED. Our 5-year renewal of accreditation is valid through June 30, 2023, and renews every 5-years. Click here to view our accreditation profile on AdvancED. Learn more about AdvancED - What is Accreditation? Parents and interested community members can learn more about the AdvancED Accreditation Process at www.advanc-ed.org. 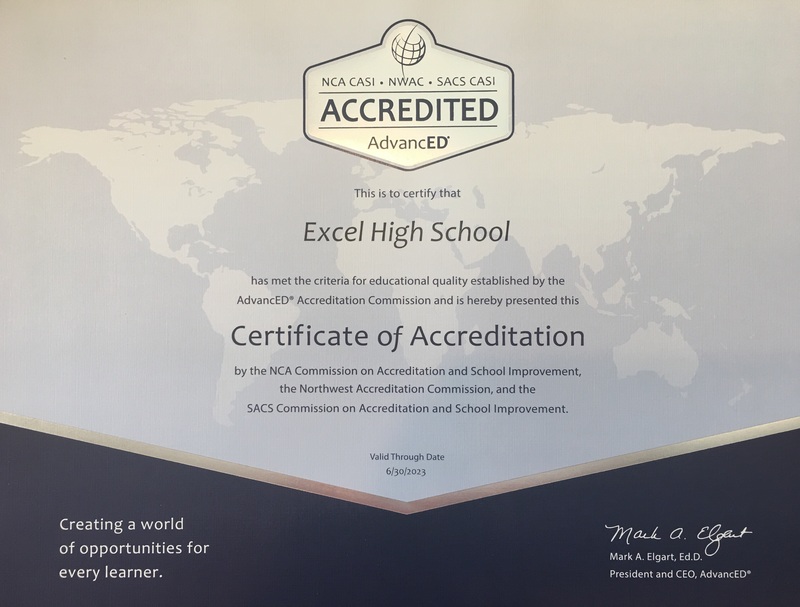 Excel High School is a State recognized accredited high school that serves students in all 50-States and in many other nations around the world. Excel High School is an accredited, Minnesota, non-public school. You can find Excel High School's institution profile listed in the Minnesota Department of Education's database by clicking here. Excel High School is a part of the Excel Education Systems Independent School District. Excel Education Systems schools are regionally accredited by AdvancED. Based on our national scope of operation, Excel High School also seeks registration and State approvals for States that have a process for further recognition for non-public schools. Excel’s accreditation is recognized by all 50-States’ Departments of Education. Excel High School is recognized by the Virginia Department of Education as an accredited non-public school. 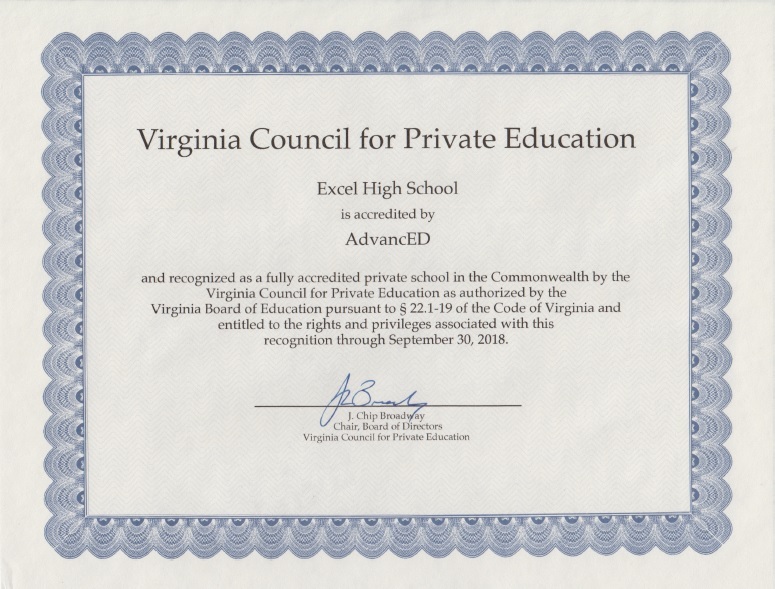 EHS has been continuously recognized by the Virginia Council for Private Education (VCPE) as an accredited private school since 2013. Excel High School is an authorized course provider under an articulation agreement with the University of California a-g course program. Excel's courses are being submitted for full, individual approval in February 2019 when enrollment opens. The school will post an official announcement once the A-G courses are fully approved. Excel High School is registered with the College Board and the ACT, Our National School Code for SAT, ACT, and FAFSA is 240707. Accreditation is one of the biggest concerns for people who wish to earn a high school diploma online. A school accredited by the appropriate accrediting body can grant diplomas that lead to greater income opportunities and the chance to attend an accredited college or university. A diploma that is given by an unaccredited or “fake” school can turn out to be a huge waste of time, energy, and money. Do yourself a favor and make sure you know the facts about accreditation before you register for any online program claiming it is accredited. Excel High School is a Regionally accredited high school. Some colleges and universities will only accept a regionally accredited high school diploma. It is our experience that all colleges and universities in the US recognize a Regionally accredited high school diploma. REGIONAL AND NATIONAL INSTITUTIONAL ACCREDITING AGENCIES FOR THE UNITED STATES. Scope of recognition: the accreditation and preaccreditation ("Candidacy status") of schools offering non-degree, postsecondary education in Arizona, Arkansas, Colorado, Illinois, Indiana, Iowa, Kansas, Michigan, Minnesota, Missouri, Nebraska, New Mexico, North Dakota, Ohio, Oklahoma, South Dakota, West Virginia, Wisconsin, Wyoming, and in the Navajo Nation. Title IV Note: Only those vocational/technical schools accredited by this agency that offer non-degree, postsecondary education may use that accreditation to establish eligibility to participate in Title IV programs. If you have any questions concerning your college and financial aid, please contact the Excel High School Director’s off at (952) 465-3700. Accreditation is a third-party peer review process for a school’s programs and policies to see if it meets certain criteria, generally set by an outside agency. When a school is found to meet the minimum criteria, it is granted accreditation. This process is usually very comprehensive and includes validating the school’s claims in depth for accuracy and to protect the consumer. The agency granting accreditation should be recognized by the State and US Department of Education to ensure acceptance. Accreditation is meant to protect students, schools, and employers and ensure academic quality. It ensures that a school is teaching its students at a State and nationally acceptable level and provides programs that are found to have value and substance. Accreditation also guarantees the schools employs certified instructors that are qualified to teach the appropriate subject matter. When a student receives a diploma from a school accredited by the right agency, he/she can be assured that it will be accepted by all employers, colleges, universities and schools, government agencies and the military. Likewise, when an employer is considering a new hire, they can be assured that a graduate from an accredited online high school has received the training necessary and didn’t just pay for a diploma from a “diploma mill” school. What if my school isn’t accredited? If you choose a school that isn’t accredited, you will find that many businesses and schools won’t accept your online high school diploma. It may be difficult to convince employers and colleges to take your diploma seriously, particularly if it is in a traditional subject (math, English, history, etc.) If your diploma is in a less traditional subject, one which most schools do not offer, it may be easier for employers to accept your degree. It also helps to make sure your school is registered with the appropriate State agency; for example, the State Department of Education and membership to the Better Business Bureau is also helpful to ensure quality and legitimacy for an online high school diploma program. Why should I take Excel’s word on what a valuable accreditation is? Excel High School guarantees 100% acceptance of our diploma with a full money-back guarantee. As a regionally accredited high school, we have never had a college not recognize our accredited high school diploma. Graduates of Excel High School find success in college, the Military and with employment.